London designers Campaign have installed a cardboard shop selling architecture books as part of the London Festival of Architecture. Called Foldaway Bookshop, the temporary store is stocked by RIBA Bookshops and will be recycles at the end of the installation. Recommendations from London architects and critics are displayed on the walls alongside projected films featuring London landmarks. The shop remains in place until 4 July. Photographs are by Paul Greenleaf. Opening for just 13 days, Foldaway Bookshop is a pop-up specialist bookshop created for the London Festival of Architecture 2010. 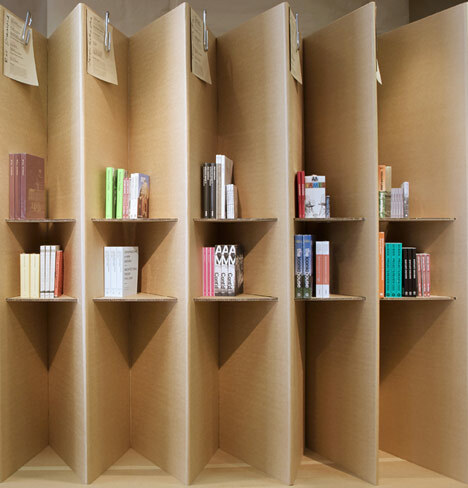 As the digital revolution advances, Foldaway Bookshop, celebrates the art form of the printed publication and create a key destination and sociable hub to welcome visitors to the Festival, a place that embodies the concept of the LFA2010 – ‘the welcoming city’. Stocked by RIBA Bookshops, Foldaway Bookshop is a specialist architecture bookshop featuring the latest must-have high quality publications and the most coveted architecture classics. The collection includes vintage publications and a collection of artists’ books selected by Handmade & Bound, which are architectural in form or document life in contemporary urban spaces. Foldaway Bookshop will have a bespoke interior created by design studio Campaign. The walls, shelving and sales counter will be constructed entirely from cardboard and recycled at the end of the Festival. Eurban’s Carbon Cube and the Flexible Love Chair, which is made entirely of card, will provide comfortable seating in store. Central to the Bookshop will be a display of vintage copies of Architectural Design, sourced from the personal collection of the late Monica Pidgeon, who edited the journal 1945-75 and was responsible for establishing it as the premier international architectural magazine. Book recommendations from a selection of London's practising architects and critics will be displayed throughout the store to enhance the browsing experience. Projections of clips from seminal films featuring modern architecture and the city will animate the space, creating a lively and sociable space to host a variety of events including book launches, signings, and talks.